This morning at ISSCR 2014 in Vancouver things kicked off in an exciting way, kind of akin to a World Cup soccer/football match for fans of stem cells. 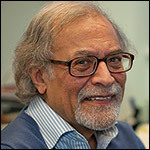 Azim Surani (pictured at right) received the McEwen Award for his innovative research on germ cell fate and epigenetic control mechanisms. It was great to see Paolo Bianco, Elena Cattaneo, and Michele De Luca receive the ISSCR 2014 Public Service Award for their efforts in Italy to protect patients from the Stamina Foundation (for more that threat to the stem cell field, see here). It’s resonates even more strongly that Cattaneo is part of the trio that got this ISSCR award as she was this blog’s Stem Cell Person of the Year Award winner for 2013 for her efforts. We also heard about the launching of a new, very exciting ISSCR annual award. This award, the Ogawa Yamanaka Award, will be focused on the most exciting clinical/translational stem cell research and the recipient will get a cash prize of a whopping $150,000. Later in the day, we heard some great science from stem cell scholars Gordon Keller, Brigid Hogan, Olivier Pourquie, and Lorenz Studer. There’s reason for hope from these talks for future stem cell therapies for a variety of disorders including Duchenne Muscular Dystrophy, lung disease, and Parkinson’s Disease.